How to Repair Your Wood Siding | Crenshaw Lumber Co. Inc.
Wood siding, for all of its classic elegance and historical significance, can require a lot of upkeep. Beyond the usual scraping and painting, there will be times when it needs a little more than just a fresh coat to hide its blemishes. The good news is that regardless of the type of wood or style of board – even shingled siding, the methods are similar. First, depending on the nature of the damage, you should determine the cause and fix that before attempting your repair. For example, if leaky gutters or bad downspouts are the reason, those issues should be addressed before repairing the damaged wood.If the wood is cracked or dented, then some filler and sanding may be all you need prior to painting. If there is a split or worse, all is not lost. The boards can be replaced with relative ease. Each board is held in place by nails driven through the course above it. Try only to remove what is necessary. If a window, corner or doorway is close enough, it generally looks better if you remove all the way to that point thus avoiding unwanted seams. To remove a damaged board, work a chisel or flat bar along the bottom edge of the piece in question. Take care not to damage the surrounding pieces. If nails pull out along with the board while it is pried up, pinch the nail with pliers or a pry bar and push back down on the board until the nail head pops out. Remove the nails. If the nails aren’t accessible from the front, slide a hacksaw blade behind the board and cut the nail. Try not to scrape the surrounding pieces of wood. If you only need to remove a small section of a board, drive a wedge up under the piece above the section you wish to remove. Do this for each side of the area you want to take out. Make your lines using a square and score over them a couple time to avoid splintering. Cut along your lines with a hacksaw and pull out the damaged section. In this situation, make sure your replacement piece is cut for a snug fit. Tap it into place before removing the wedges. When securing your board, use coated nails to avoid discoloration through your paint job. Drive nails in the top and bottom of the board and fill the nail holes. Caulk around all seams with a paintable silicone or acrylic caulk. 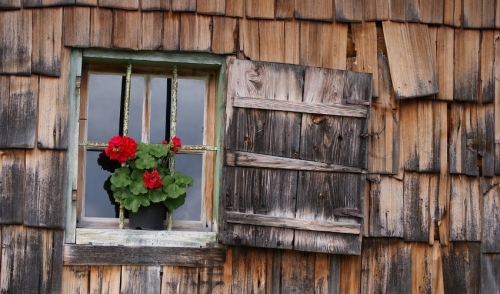 Where wood siding is concerned, preventative maintenance is key. Make sure water infiltration is kept at a minimum. Periodically check for cracks or gaps along old caulk seams. All gaps should be sealed prior to painting. Also, keep an eye out for termite damage and rot. If you have loose siding and see wings or insect castings falling from between the cracks, consult a pest control professional to see if termites are present. Keeping ahead of the causes of damage will prevent the need for such repairs in the future.